Perfect lighting for any situation. Equipped with 12 energy saving and durable LEDs guaranteeing optimal music desk lighting. The brightness is adjusted using a variable dimmer switch. 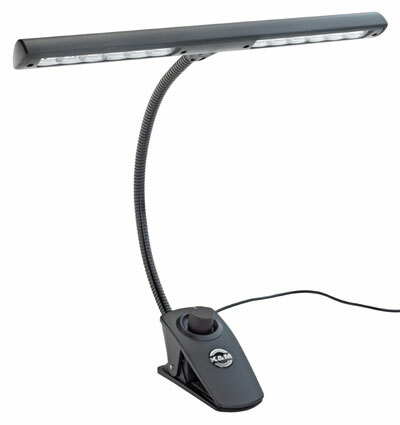 The flexible goose neck ensures that the light is ideally positioned. A handy clip provides for easy attachment to all music desks with a thickness of 25mm. Runs on AA batteries (included). A power supply with a 3m cord is also included. This is a nice, slim light that is perfect for illuminating the score without shining in your eyes. The dimmer is a useful feature to have. The clip to attach the light works well, but you do need enough space and a somewhat sturdy stand since it has to hold the light. I use it with my K&M stand and attach it to the top crown on that stand. Possible improvement: the light is very white, warmer LEDs would be more pleasant to the eyes at night. The lights can flicker a bit at low setting but increasing the brightness a bit solves that. Q: In a dark or dimly lighted room, how many sheets will this light realistically illuminate? The lamp is designed to clip onto a standard sized music stand so it will optimally illuminate 1-2 pages of music although it could probably work for up to 3 pages.